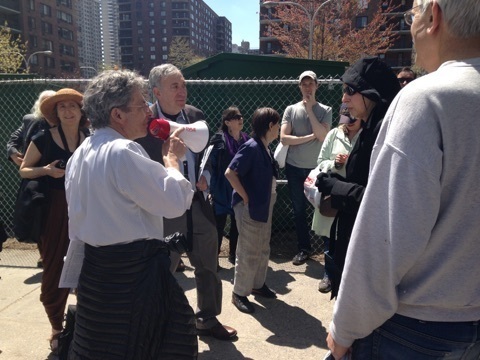 It's been such a pleasure receiving feedback from those who joined us May 2nd for Jane's Walk 2015: "West Side Urban Renewal: Blight or Right in the Sight of Jane." Keep 'em coming! I've included some responses below. 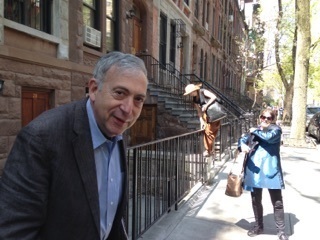 Thank you very much indeed for a wonderful afternoon exploring the Upper West Side. We really must adopt this formula in Edinburgh, and seek to place some focus on community, rather than mere built heritage, important though that is. Fascinating to learn about the ups and downs of urban renewal. Such a treat to hear how the tenants literally saved 325 Central Park West from demolition with their floor-by-floor dinner party. Smiled at seeing the preservation of the inviting 3- to 5-story brownstones on W 94th. in stark contrast with the daunting big box stores built on a formerly blighted section of Columbus Ave and 100th. But walking toward Manhattan Ave on W. 100th St, what a relief to experience the human scale feel of the small businesses intermixed with residential buildings. Could only imagine how at home Jane Jacobs would have felt. 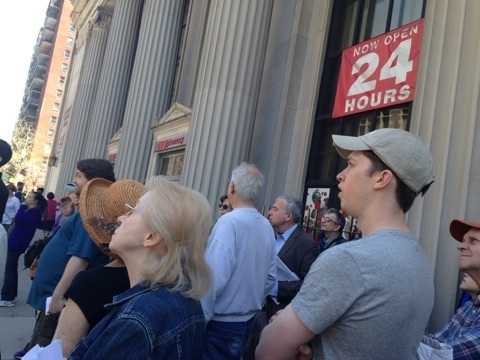 Subject: Wonderful walking tour! I learned so much! A few resources for the next time! Thanks so much for such a wonderful walking tour! I really learned a lot despite having lived in the area since 1977. I hope you do it again. 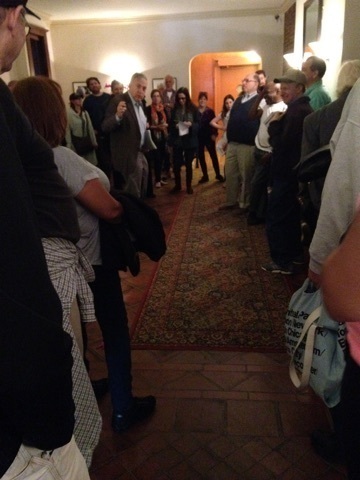 I'm a big fan of Jim's tours, and I hope to be able to continue going on the famous October tours organizing for ESC folks. Should you do the WSURA tour again, here are a few resources. After the initial resistence from the Strycker's Bay Neighborhood Council and several changes to the plan, the urban renewal project started. The first rounds of demolition and construction occurred in the 1960s. By 1970, there were still many buildings that had not yet been demolished, so there was a second round of resistence: "Operation Move-in," summarized to some degree in the article noted below from the journal of the Center for Puerto Rican Studies. Should you want to know more about the squatting, and to some degree the history of the struggle against the urban renewal area, you can speak with Tom Gogan, who is cited several times in the article. He is currently going through the papers of Bill Price,which are now at the Tamiment Library at NYU; Bill was very involved in Operation Move-In as a squatter and then in the struggles of the late 1970s and 1980s. He continued to live in one of the squatter buildings on West 87 Street until he moved to Goddard Riverside senior housing. He passed away several years ago. (I can give you the contact for Tom Gogan). After all urban renewal plans were stopped because of the federal moratorium in 1973, the ones in progress started up again in 1977. Operation Move-In was the reason there were so many occupied buildings in 1977 which had originally been slated for demolition. I moved into the neighborhood in 1977. A neighborhood on my floor (who was also a friend) was working as an organizer for Strycker's Bay and recruited me and other folks to form a technical advisory committee to work with the newly movilized neighborhood residents to save as many buildings as possible and assure that they would be preserved for low and moderate income residents. One of the outcomes of Operation Move-In, was the struggle around Site 30 (Columbus between 90-91). Squatters were persuaded to vacate the buildings because they had been assured that 160 public housing units would be built on that site. Trinity School and a group of brownstoners (Committee of Neighbors to Insure a Normal [sic] Urban Environment) sued mostly on the grounds of the presumed "tipping point" (too many low-income people would tip the neighborhood negatively). They eventually lost after 10 years, but by then the funds appropriated were insufficient to build. Also HUD had determined that housing for families should be no more than three stories high. 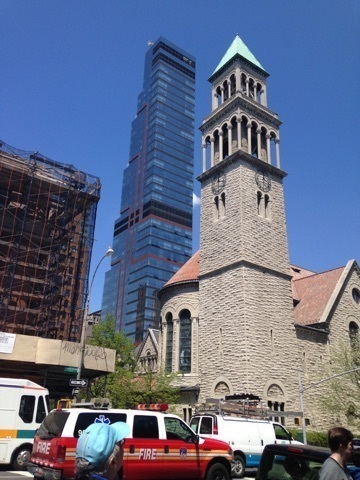 In the end, most of the site is market rate, with some 12 units of family housing (on 90th st.) and a building for seniors (the building on 91 St. where McDonald's used to be and now is an urgent care clinic). This article by Harold McDougall, an African American lawyer who used to live in the neighborhood before moving to DC to teach at Howard, lays out the case (see pp. 181-193).http://ir.lawnet.fordham.edu/cgi/viewcontent.cgi?article=1176&context=ulj It also provideds a brief summary of the changes that Strycker's Bay Neighborhood Council was able to get made to the plan (e.g., the commitment of low-income housing went from 400 to 2,500). 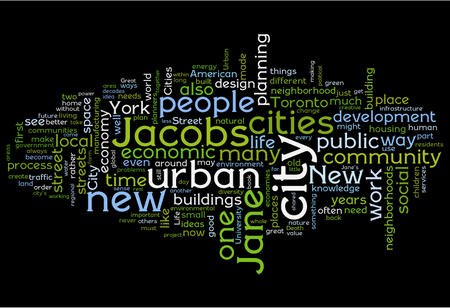 If the urban extraordinaire were still with us, Jane Jacobs would've turned 99 years old today. 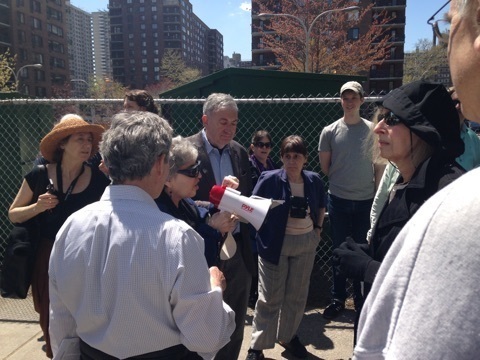 This past weekend, New Village Press celebrated her legacy by hosting a Jane's Walk titled "Upper West Side Urban Renewal: Blight or Right in the Sight of Jane?". Every year during the first weekend of May, hundreds of groups around the world host these Jane's Walks (over 200 in New York City alone this year! ), which are free tours of communities by communities. Our walk started at 92nd Street and Central Park West, looping through the Upper West Side, closing with a discussion with one of the original residents one of Park West Village (site of the first instance of Robert Moses' tactics of distributing premiums, contracts, and retainer to favored and incompetent friends being revealed to the press) before we headed to The Pool in Central Park for a breezy and sunny picnic. 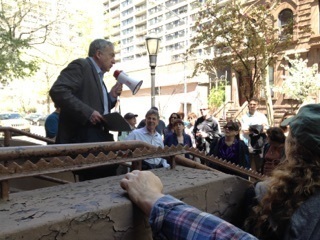 Along the way, walk leaders James Wunsch, Lynne Elizabeth, and Calman Lobel pointed out the co-existence of brownstones for both low-income and high-income residents on 94th Street, a few examples of how NOT to design a public space, and the first bank to offer women the right to control their own funds (it's now a CVS Pharmacy). Our favorite part, though, was when community members chipped in and shared their own stories of how they remembered a specific playground from their youth or described how the building they live in has changed over the decades. We invite you to continue in this delightful process of community sharing! We'll be posting input from attendees, and we invite you to share your own responses and experiences in the comments section. Scroll through the photos here and post your own photos, videos, or audio recordings [or email them to jourdan (at) newvillagepress (dot) net]! We'd love for you to help us turn Saturday's walk into an ongoing digital journey! The walk started in the lobby of 325 Central Park West. Built in 1899, it is distinguished by the fact that it was the only CPW structure south of 96th Street slated for demolition. The tenants, mostly female, hosted a "7-Story Buffet" for city officials to save it from destruction. The lobby displays historic photos of the surrounding area. Jim Wunsch led the majority of the tour (and our always adventurous co-host Lynne Elizabeth appears to be getting into some sort of trouble in the background!). A long-time West Side Marquis resident shares his experience of the building's change over time. 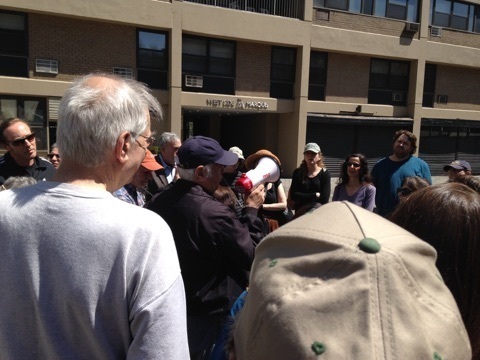 Cal Lobel, long-time UWS resident, fills the group in on slated controversial infill construction on 100th Street. 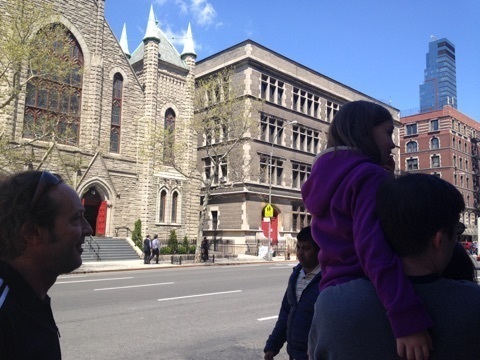 The Upper West Side's architectural and historical diversity paired with our group's diversity of ages made for an interesting and informative morning! Here we are in front of what was once the 1927 East River Savings Bank but is now a CVS Pharmacy - given the bank's claim to being the first to offer women the right to control their own money, we were excited to be accompanied by Elizabeth Cady Stanton's great-great-great-grandson! 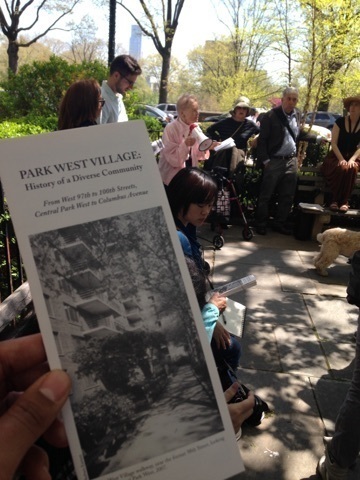 Winifred Armstrong shared her firsthand knowledge and experience with as well as literature on Park West Village's history. Originally called Manhattantown, this project displaced a vibrant African-American community on 98th and 99th Streets between Central Park West and Columbus Avenue. Tell a story about a moment you felt true belonging—or the opposite—in this country or in your community. Describe an experience that showed you something new or important about the state of our union. Share about a time you stood together with people in your community. Each story will be transcribed online to form a greater patchwork where the dialogue can continue. Shortly after January 30, the USDAC National Cabinet will discuss common elements that arise in order to identify the true state of the union. 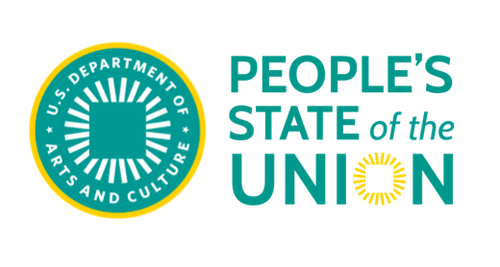 At the same time, poets nationwide will collaborate to create the “2015 People’s State of the Union Address,” based on the stories shared online. The Address will be read on February 1 at the Bowery Poetry Club in New York City and will also be available online in video and text. This is the largest call for creative communal action of this kind in history. The USDAC is encouraging anyone to host a story circle or a gathering with multiple story circles their area. The deadline to sign up to host is January 8. For more information about hosting, click here. Arlene Goldbard, author of New Creative Community: The Art of Cultural Development and contributor to What We See: Advancing the Observations of Jane Jacobs both released via New Village Press, is one of the creative minds involved in the USDAC where she serves as the Chief Policy Wonk. 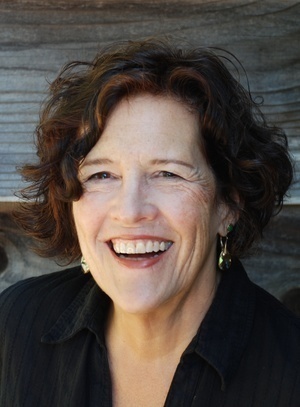 Arlene is a respected voice in community development, cultural activism, and social justice. But, despite his impatience with London's uneven progress, Gehl's preference in all areas of his field is for purposeful incremental change. The term "urban renewal" has become synonymous with top-downgrand projets that destroy more than they create and end up being more trouble than they are worth to all but the few who profit from them. Gehl says his company has been involved a several projects to change poorly-designed and maintained housing estates for the better, preferring to replace only some of the dwellings rather than sweep the whole lot away, and concentrating on humanising and re-ordering open areas to correct what he describes as "the modernist mistake" by turning these into "spaces for people to enjoy, rather than voids." As an advocate of What We See, your engagement in the community has kept the conversations real and your purchases of our books have kept our mission alive. However, book sales alone, cover half the publishing costs, the other half comes from funding. Thats why, in a bid to underwrite the next year of publishing, What We See’s publisher, New Village Press is calling all well-wishers, enthusiasts, advocates & patrons to join their Community Supported Publishing! Support us in building vibrant, healthy and compassionate communities. Celebrate and reward the ingenuity and compassion of people rebuilding society. Help make the world a better place. Enable New Village Press to continue its work—the kind of specialized publishing commercial publishers fail to risk—and join the creative, citizen-initiated, social transformation movement. Together, we can lift society out of stuck places in ways that argument, armies, and legislation can never accomplish. Please help spread the message and/or place your contribution here. 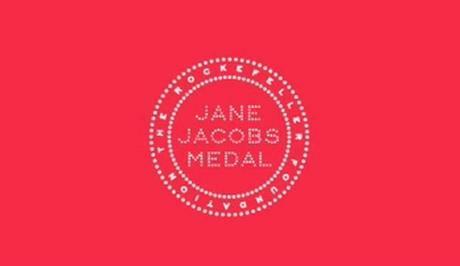 Last night - in conjunction with the presentation of The Rockefeller Foundation’s Jane Jacobs Medal - the Municipal Arts Society (MAS) hosted their annual Jane Jacobs Forum at The Times Center, New York. A panel of leading women in the fields of architecture and planning, landscape architecture, development, community development, business and the arts, discussed the topic of Women as City Builders. Invited to bring What We See, publisher New Village Press was honored to hear MAS President, Vin Cipolla, use the theme of the book as a launch for his introductory remarks. 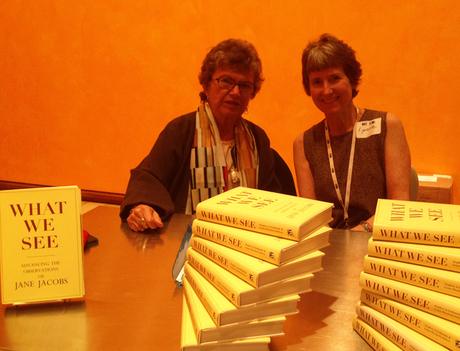 Contributing author, Roberta Brandes Gratz and co-editor, Lynne Elizabeth were delighted to chat with event attendees and even sign a few books! New Village Press, publisher of What We See was invited by The Municipal Arts Society of New York and The Rockefeller Foundation to attend the presentation of the Jane Jacobs Medal 2013 Awards Ceremony, honoring Bette Midler for Lifetime Leadership and Ian Marvy for New Ideas and Activism. Since founding the New York Restoration Project (NYRP) in 1995, award-winning actress and singer, Bette Midler has been a passionate and influential advocate for the city’s most forgotten spaces; parks and community gardens in underserved neighborhoods. NYRP has revitalized neglected parks in upper Manhattan; restored storm-ravaged parks in Queens and Brooklyn; and transformed a derelict stretch of shoreline into Sherman Creek Park, a waterfront gem featuring the first boathouse on the Harlem River in over 100 years. Midler led the charge to save 114 community gardens from development, and NYRP continues to maintain and program 52 of them, with concentrations in East Harlem, Central Brooklyn and the South Bronx. Together with Mayor Bloomberg, Midler launched the MillionTreesNYC initiative, which is now slated to reach its ambitious goal to full two years ahead of schedule. 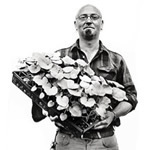 By nurturing a new generation of young leaders through the operation of a socially-responsible urban farming enterprise, Ian Marvy co-founded Added Value in 2001, with the aim of building Brooklyn’s Red Hook into a more sustainable neighborhood. Partnering with neighbours, civil society, City, State and Federal governments to transform acres of unused land into vibrant urban farms. These farms serve as community centers where thousands of men and women, young and old, learn and grow together. They are inspiring platforms that promote community development, economic activity and environmental sustainability. Under Marvy’s leadership, Added Value has demonstrated that urban agriculture is a powerful catalyst to activate public space and motivate youth to positively engage with their community. They have pioneered innovative programs that support food access for low income communities, educational initiatives for public school students and agricultural projects benefiting urban and rural New Yorkers. Marvy is an Echoing Green Fellow, a Petra Social Justice Fellow, a Union Square Awardee, and the National Resource Defense Council/Earth Day Environmental Activist of the Year. He is the creator of the Five Borough Farm report and frequently consults on new projects, for funders, and government on urban agricultural projects.